Q: What do Morrissey, Beck, Paris Hilton, AFI, Cheap Trick, and Imperial Drag all have in common? A: Roger Joseph Manning Jr.
… So, this guy’s been around for 20 or so years, and in this time, he’s left his handprints on television, movies, and popular music. The page on his website dedicated to all of his credits is huge, and much longer than I have a witty description for. Manning is most notably a studio keyboardist, as well as a founding member of Jellyfish, Imperial Drag, The Moog Cookbook, and TV Eyes. 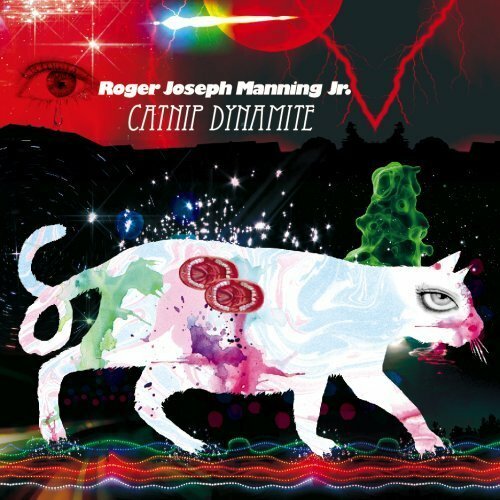 He’s been around the block a few times, and because of it, his third solo album, Catnip Dynamite, sounds a little like a time machine. It’s ’70s mod-rock, lounge, surf, and a taste of the medieval. Piano, wicked guitars, chimes — even the occasional harpsichord and well-placed falsetto — are layered and layered and layered. This is what Catnip Dynamite is made of. The songwriting more or less reminds me of the kitschiness of the ’50s—titles like “Down in Front,” “My Girl,” and “Drive Thru Girl.” “Drive Thru Girl” starts off with a monologue imitating a music award presentation. It rolls into saloon-style piano and a full audience clap-along. In fact, you can hear the audience singing and laughing with Manning throughout the track. And there’s a kazoo. It’s whimsical and silly, for lack of a better description. This album’s retro but futuristic at the same time. Some songs sound like spaceships. On other tracks, the distinctive call and response layered vocals make me think, “Scaramouche! Scaramouche! Will you do the fandango?” The album is mostly upbeat, with a few more serious and heartfelt songs that don’t stick out and don’t fade into oblivion. If you don’t take your music too seriously, you should give this a try. My golden standard is: if the band or musician sounds as if they’re having fun, then how can you not? Manning’s definitely having a blast. Enough said. Rachel Helm is a former REDEFINE magazine Staff Writer.